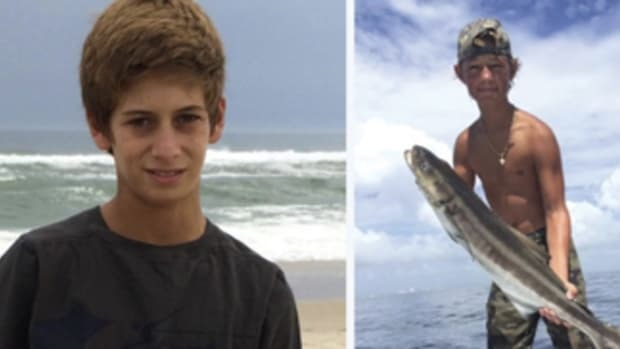 The parents of 14-year-old Austin Blu Stephanos, who was lost at sea with a friend July 24 in a squall off Jupiter, Fla., are working with two Florida lawmakers to introduce a bill that would give boaters an annual 25 percent discount on their boat registration fee if they own a properly registered 406 MHz EPIRB. “Right now our goal is getting the bill passed,” Austin’s mother, Carly Black, of Tequesta, Fla., said Friday at beacon maker ACR Electronics’ booth at the Fort Lauderdale International Boat Show. Austin’s father, Blu Stephanos, was in Tallahassee Friday, meeting with Sen. Joe Negron and Rep. Marylynn Magar on a bill for the spring session of the Florida legislature. Stephanos and Perry Cohen, who also was 14, were the best of friends who often fished and dived and boated together. They went out Jupiter Inlet on July 24 in Austin’s 19-foot outboard to fish on the ocean and were lost, probably in a vicious squall that swept through the area. Rescuers found the boat two days later off Daytona Beach, but not the boys. The boys were not carrying an emergency beacon. ACR is donating $10 for every EPIRB it sells through the end of the year to the AustinBlu Foundation, which Stephanos and Black have founded to raise awareness and promote educational programs to improve boater safety, particularly among young people.